I often wonder, as a lawyer and the child of a Holocaust survivor, if I would be able to defend a skinhead charged with a racist crime. Can a person shut off their emotions and take on a case that is at odds with their moral compass? This is the premise of Cherry Docs, a two-hander playing at the Pacific Theatre until April 28. Playwright David Gow penned the piece in 1998 as a response, in part, to the homophobic attack by a group of skinheads on his university friend and, in part, to his Jewish Belgian family’s Holocaust experiences. The success of the play and its international acclaim led Gow to adapt the story for the big screen. Its cinematic debut came in 2006, as Steel Toes. It won several awards on the film festival circuit. In the two-actor play, which features John Voth as Danny Dunkelman and Kenton Klassen as Mike Downey in the Pacific Theatre production, Danny is a Jewish legal aid lawyer who has been assigned the task of defending Mike Downey, a 20ish, tattooed skinhead, who is charged with murder in the stomping death of a Pakistani fast food worker in a back alley in downtown Toronto. The play’s title represents Mike’s pride and joy, his steel-toed, cherry red Doc Marten combat boots, which he is wearing when he commits his hate-motivated crime. The rationale for Mike’s unprovoked, drunken attack is his perception of the decline and fall of white male supremacy as brought on by what he sees as unchecked immigration, reverse discrimination for employment opportunities and a ZOG (Zionist occupation government) conspiracy of the Jewish elite. Danny aggressively challenges high school-dropout Mike to formulate a convincing defence strategy, taking him through “the eye of a needle” in an effort to make him stand up and be accountable for his actions. The two travel their own paths of discovery through the seven months of legal proceedings. Mike’s journey leads him to a path of redemption, while Danny struggles. Danny must confront not only his violent dislike for his client, but his own racism; in doing so, he explores his Judaism and its tenets of atonement and forgiveness. The biblical names of the characters Daniel (in the lions’ den) and Michael (the archangel) suggest an allegory, “A battle from above played out here,” said Gow. As the story unfolds, we see the impact that two ideologically opposite humans can have on each other, and that Danny is no saint and Mike no devil. All of the action takes place in the prison, where Mike is being held in administrative segregation. 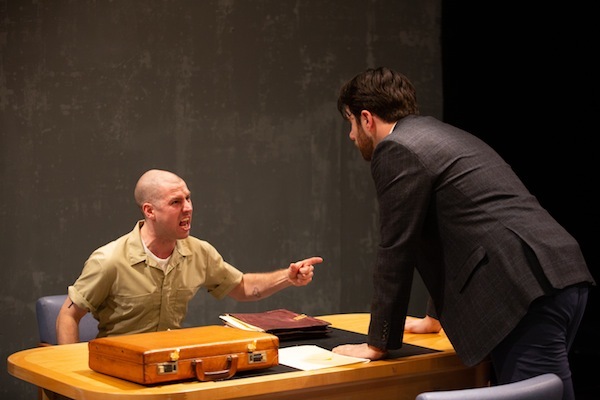 The style – alternating monologues from the protagonists followed by intense bouts of verbal sparring – and the sparse set (two chairs and a table) are appropriately stark for the subject matter and the intimate theatre space. The costumes also are uncomplicated – Mike’s prison jumpsuit and Danny’s business attire. Subtle lighting and sound cues complete the atmosphere. Klassen is superb in his portrayal of Mike. At the opening night reception, he shared with the Independent that he had prepared for the role by talking to a reformed neo-Nazi skinhead, which gave him insight into his character. While Voth is solid as the defence attorney, he is not as engaging as Klassen. Two particular scenes bear mention. In one, the two actors stand at opposite ends of the stage, just breathing and looking at each other with no words spoken – the silence is more powerful than any dialogue. In the second, Mike sits alone on the stage, repeatedly opening and closing a lighter, his face mirrored in the glow of the flame – again, the silence says it all. Kudos to director Richard Wolfe for bringing all the parts of this production together into a riveting whole. 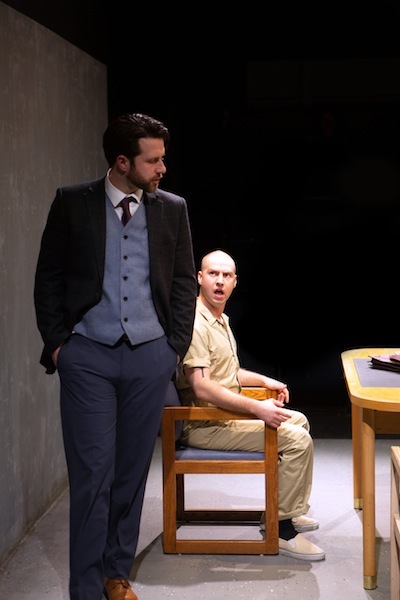 Cherry Docs is, indeed, a thought-provoking play, whose themes remain timely and relevant. It is difficult to perform and a brave choice for Cave Canem Productions and Pacific Theatre – it is both a visceral and intellectual experience, suitable for older teens and up, as it contains mature subject matter, violence and profanity. For tickets, call 604-731-5518 or visit pacifictheatre.org. 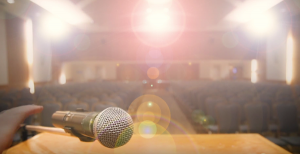 Historical ignorance has been in the news recently, with polls indicating widespread lack of awareness of the Holocaust, especially among young people in North America and Europe. (See jewishindependent.ca/much-work-left-to-do.) Some media reports got the story wrong, however, claiming that many people “don’t believe” six million Jews died in the Holocaust. The reality is that many people “don’t know” this fact, and there is a big difference between not knowing and not believing. Then there is a different phenomenon altogether: denial. Plenty of well-informed but ill-intentioned people know the truth of the Holocaust but, for various reasons, take a position that the facts are falsified. The notorious Holocaust denier David Irving is reportedly again making the rounds in Britain, promoting his ahistorical ideology. In a nice contrast, Irving’s nemesis, Prof. Deborah Lipstadt, is back in the news promoting her new book, Antisemitism: Here and Now. Lipstadt went from respected Emory University professor to a sort of global superstar when Irving sued her for libel in a British court in 1996 for correctly characterizing him as a Holocaust denier. Although Lipstadt is an American, she and the book’s U.K. publisher were targeted because Irving apparently thought that country’s libel laws might serve his cause. In the United Kingdom, libel law places the burden of proof on the defendant instead of the plaintiff. As a result, the trial played out as a public history lesson, with Lipstadt’s legal team forced to prove the historical truths of the Holocaust. They did, of course, and won the case. Nonetheless, Irving’s career as a provocateur and historical revisionist continues. More serious than a nasty British gadfly is the Holocaust denial taking place in Poland right now, a phenomenon that has led to a collapse in Israeli-Polish relations. Until recently, Poland was one of Israel’s closest allies on the world stage. While Polish society has never undergone the self-reflection that Germany did after the Holocaust, Polish governments developed excellent relations with the Jewish state. After the fall of the communist regime, relations between the two countries grew quite warm. Trade and diplomatic relations at the highest levels flourished. With the election of the right-wing nationalist Law and Justice party, in 2015, things began to change. Last year, the Polish government passed a law criminalizing speech that references Polish collaboration with the Nazis during the Holocaust. Canadian Prof. Jan Grabowski, who spoke in Vancouver last fall, heads a team of researchers, most of them in Poland, who are scouring archives throughout that country amassing what is probably the most comprehensive assessment ever compiled on the subject of Poles’ complicity in the Holocaust. Without Polish collaboration – frequently offered willingly and without compulsion, the research indicates – the Nazis could not have succeeded nearly so completely at their murderous destruction of Polish Jewry, Grabowski insists. Politicizing this history – that is, criminalizing the truth – has put the Polish government on a trajectory of institutionalized denial. Unlike masses of young North Americans and Europeans, the Polish leaders know very well what transpired in their country during the war. As Grabowski notes, it is not the collaborators and their descendants who are today ostracized in small communities across Poland but rather those families whose members helped their Jewish neighbours. It was inevitable that Poland’s approach would have repercussions in the Polish-Israeli relationship. It happened dramatically in recent days. The Visegrád Group, which is a cultural and political alliance of the Czech Republic, Hungary, Poland and Slovakia, was slated to meet with Israeli leaders at an extraordinary summit in Israel this week. Polish Prime Minister Mateusz Morawiecki decided to snub Netanyahu by withdrawing from the summit and sending his foreign minister instead. Suffice to say the summit is off. The leaders of the three other countries are still slated to travel to Israel for bilateral meetings but Polish-Israeli relations are on the rocks. The conflict illuminates a strange dichotomy. The government of one of the countries most affected by the Holocaust tries to blot out what they certainly know to be the truth. Meanwhile, a generation of young people look on, unaware of even the barest details of what is at the root of the uproar. The United States Senate was expected to vote this week on a bill that would make it easier for state and local governments, as well as government agencies and perhaps other bodies, to refuse to do business with groups that endorse a boycott against Israel. The bill comes after several state governments have taken steps against BDS, the movement to boycott, divest from and sanction Israel. Florida’s legislators, for example, directed officials in 2016 to create a list of companies that engage in boycotts of Israel and instructed all government entities to divest from those companies. Two years later, the state passed a bill preventing companies that engage in boycotts of Israel from bidding on local or state government contracts. 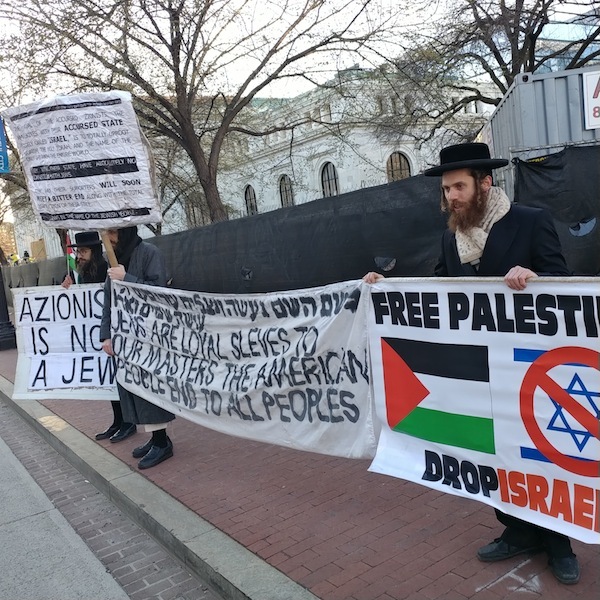 In all, about half of the 50 states have some form of statute on the subject, some simply making their opposition to BDS known, without adding punitive economic conditions. Boycotting Israel is a dumb and self-defeating position, but so is the idea of governments boycotting the boycotters. 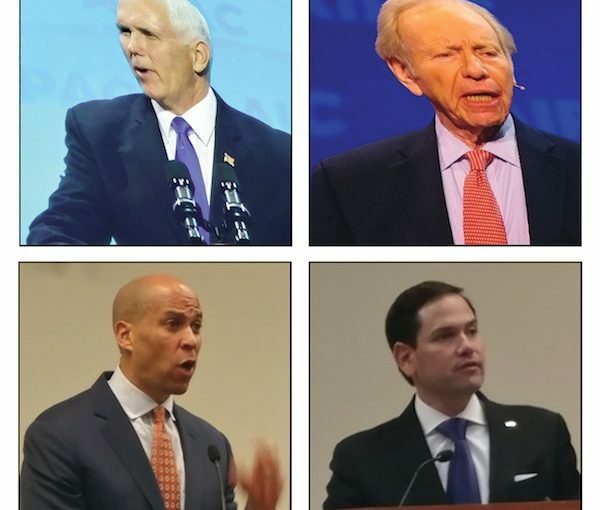 Opponents of the federal anti-BDS effort – and even some people with no horse in the race – are asking whether boycotts are covered by free speech legislation. Nobody is saying BDS should be illegal. But, when a company or individual applies to government for, say, a contract to build a road, there are numerous conditions. Non-unionized companies may be excluded, for example, or businesses may have to prove they adhere to government guidelines around equal employment. People are free to boycott Israel, and governments are free to prevent those people from obtaining contracts with them. On free speech grounds, we don’t really have a problem with the idea – and we’re pretty defensive about free speech. To us, the discussion is less a legal one, or even a moral one, than it is a strategic one. Despite their thuggish, bullying tactics, members of the anti-Israel movement love to position themselves as victims. While harassing Jewish students on campuses, shouting down speakers, making Jewish women unwelcome at women’s marches and disrupting venues where Israel and Palestine would seem to have little relevance, such as at a major LGBTQ conference in Detroit recently, they nevertheless depict themselves as tiny Davids fighting Goliath. With that in mind, legislation that punishes those who support BDS will give its advocates their first rightful justification for claiming victimhood. But there is a more important and obvious reason why we should not be legislating against BDS. We shouldn’t need to tie the hands of BDS supporters behind their backs to win this fight. Our strength must be our ability to refute the lies, exaggerations, hypocrisies and prejudices of the BDS movement. There are a million arguments against BDS. Ireland recently passed a wide-ranging Israel-boycott law and promptly realized that its high-tech sector, which is mostly propped up by American investment, could be imperiled if Ireland forces giants like Apple, Google and Facebook to choose between Dublin and Tel Aviv. While BDS is intended to be economically injurious to Israel, it can harm the very people who are advancing it. And it is more than economic damage BDS can self-inflict. Given the plethora of life-saving and life-enhancing innovations emerging constantly from Israel, boycotting that country could be detrimental to one’s health. There are countless ways to counter BDS … like pointing out that BDS hurts Arabs. Not just Israeli Arabs or Palestinians, like those who famously lost their jobs when BDS forced the closure of a SodaStream plant in the West Bank, but impoverished residents of countries adjoining Israel, too. Seventy years of its Arab neighbours boycotting and isolating Israel has done nothing to harm the massive economic and social successes enjoyed by citizens of Israel. It has only ensured that the people of Jordan, Lebanon and other countries that snub Israel suffer from being deprived of these economic, technological and scientific achievements. Since the Arab boycott of Israel went global, the discrepancies have only grown. Israel’s GDP has doubled since 2005, when BDS started to take off. The preoccupation of the BDS movement with academic boycotts is especially easy to confront: it’s the ideological descendent of book-burning. We should also be conscious that even people who take positions we support may be using us to advance their own agendas. While the Republican party has been steadfastly pro-Israel – as have most Democratic party lawmakers – this anti-BDS measure is a bald attempt to sow division among Democrats by shining a light on some of the new elected officials who diverge from the traditional bipartisan consensus on the American-Israeli special relationship. Confronting those dissenters on the issues is justified – and is being taken up by a new group of Zionist Dems, called the Democratic Majority for Israel. But allowing one party to monopolize Israel for political advantage spells disaster for American Zionists and for Israel (despite the overt collaboration of Israel’s prime minister in the Republicans’ partisanship on this issue). BDS is a bad idea. But, banning – or, more accurately, boycotting – BDS gives the appearance that Israel is indefensible on merit. That makes legislation to punish BDS supporters another bad idea. At a time when there are plenty of bad ideas to go around, this is absolutely a case where two wrongs do not make a right. Defeating BDS should be done intellectually, not legislatively.